We were delighted when Sally came to visit last month. The three of us (plus our guide Indra and driver Pak Wondo) headed off on a three-day trip to the Dayak village of Tumbang Manggu, about four hours drive to the north-west of here, along the Katingan River. The first hour’s travel is along the Trans-Kalimantan Highway (TKH), a mostly decent road built (in part, at least) by Russia in the late 1950’s. In return for their generosity, the Russians were given rights to all the forest for a kilometre on either side of the road. 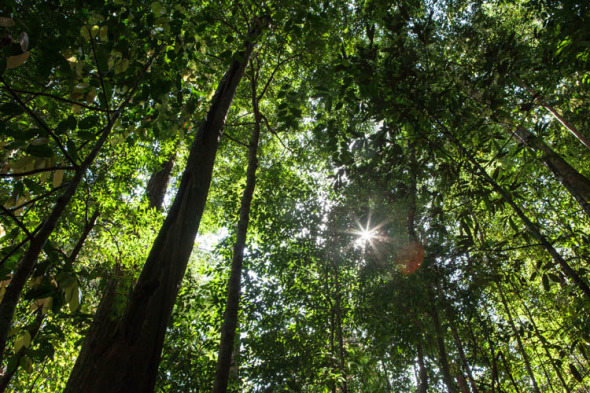 They clear-felled it, swamps and all, and much of it is now given over to oil palm plantations. 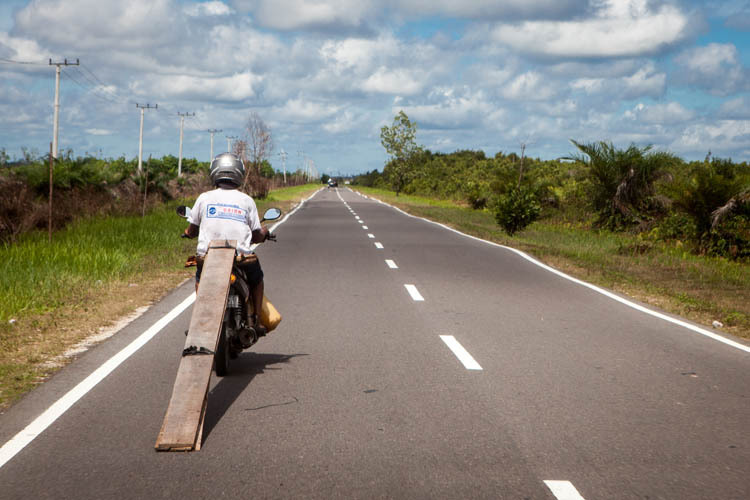 (The guy in the photo above was moving at a fair clip, and making a lot of noise as the timber planks dragged along the road behind him). 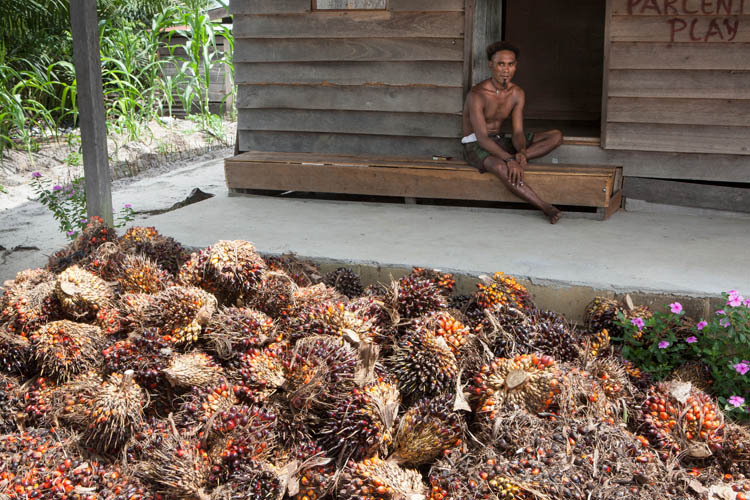 A big proportion of the oil palms are cultivated by small-holders, who sell the fruit on to middle-men with trucks who take it to the processing plants around Sampit about two hours drive west of here. Most of the growers (like this guy, who had moved here from Flores to ‘make his fortune’ growing oil palms) seem to be pretty poor. 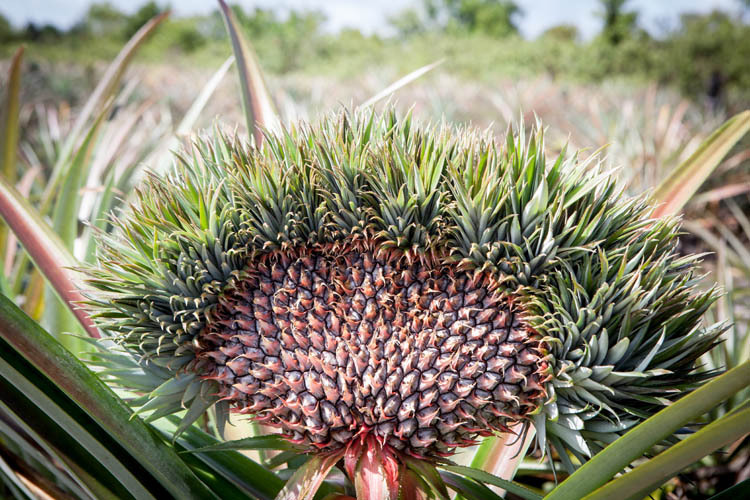 We stopped at a pineapple plantation along the TKH, and ate (and bought) some very fresh fruit from the friendly owners. They grow three varieties of pineapple here, with the sweetest and juiciest being the smallish nanas madu (honey pineapples). In the plantation there were a few really weird mutant fruit like the one above. Eventually we crossed the Katingan on a two-vehicle ferry and arrived at the village of Tumbang Manggu, where we stayed two nights in the longhouse. 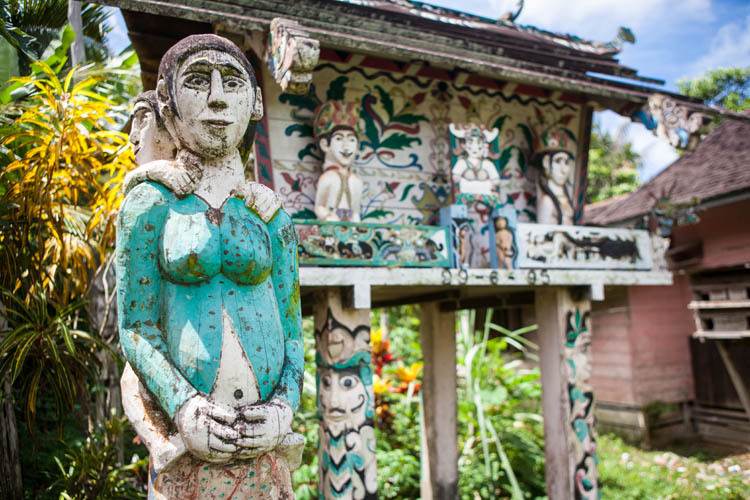 The longhouse was built only recently by Bapak Syaer Sua, who wants it to be a centre for Dayak culture. 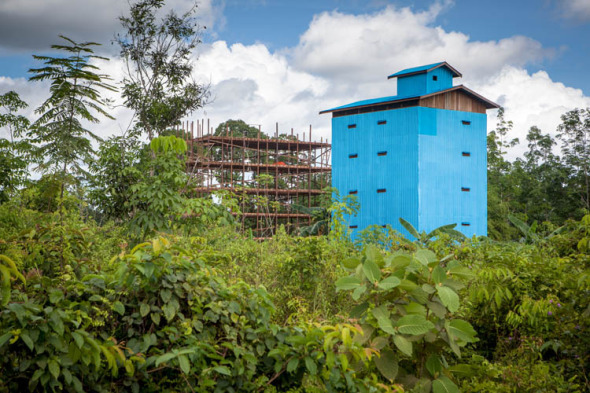 It’s a massive, solid building, made from the traditional (and now rare and hugely expensive) ulin timber (‘Kalimantan ironwood’, Eusideroxylon zwageri). This wonderful timber is incredibly hard, smooth grained, lemon-scented, strongly resistant to weathering, water damage, termites and fungal attack. The catch: it’s hard to propagate, and VERY slow growing, with mature trees being many hundreds of years old. It’s now formally classed as a ”Vulnerable’ species. The traditional betang (longhouse) is now very rare. It stands tall on high timber foundations, with only one or two steep narrow stairways for entry – even for longhouses that were the length of a football field. It’s a great place to play. Inside it’s cool and nicely lit from the side windows. 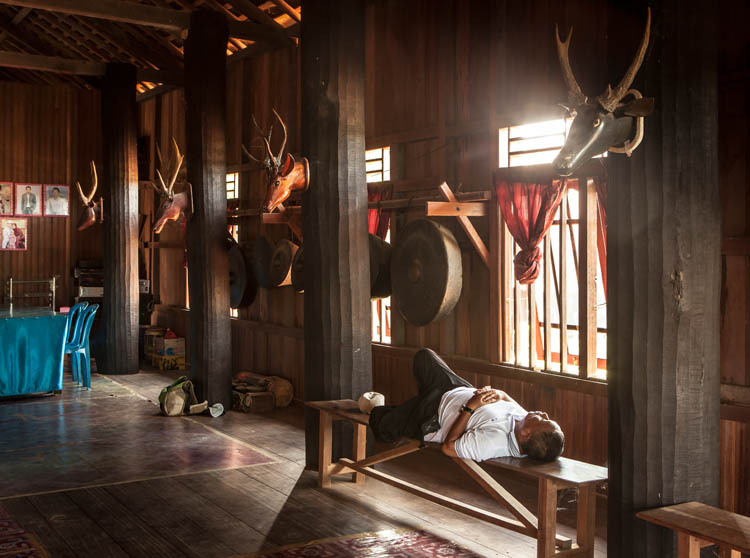 The walls are lined with gongs and drums, tanggui (Dayak hats) and tombak (spears), (carved wooden) deer heads, and framed photographs of family members, and local and national politicians. Along one of the long side walls are a series of closed-off areas for sleeping. Ibu Emitha (Syaer Sua’ wife) (at left in the photo above) is a great host, with a livewire personality and a big laugh. 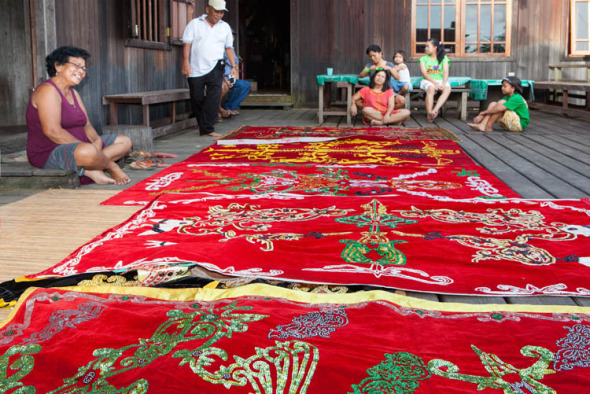 In her ‘spare’ time she embroiders large ceremonial banners adorned with Dayak motifs. 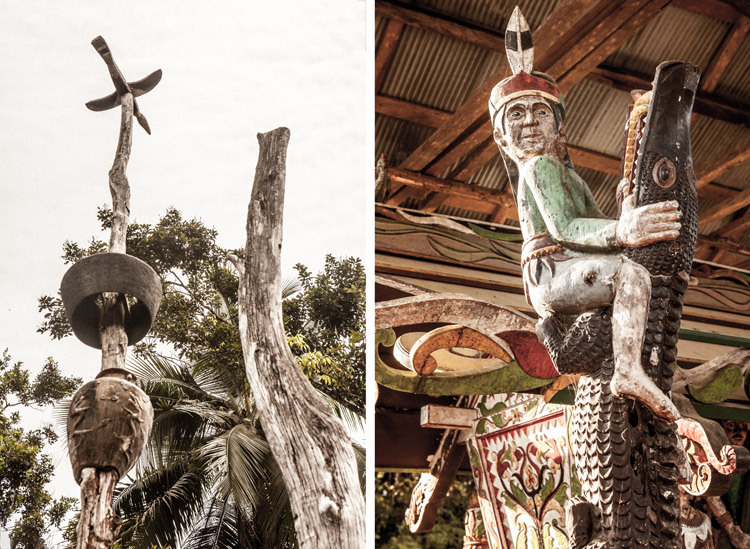 Christianity and traditional Dayak Kaharingan religion sit side-by-side in most villages of Central Kalimantan. Around Tumbang Manggu there are a number of sandung bone-vaults like the one above, adorned with effigies of the deceased and various spirit protectors. Carved ulin posts (sapundu) are usually found near to a sandung. When the tiwah funeral ceremonies are in progress, the buffalo or cattle to be sacrificed are tethered up to the sapundu. 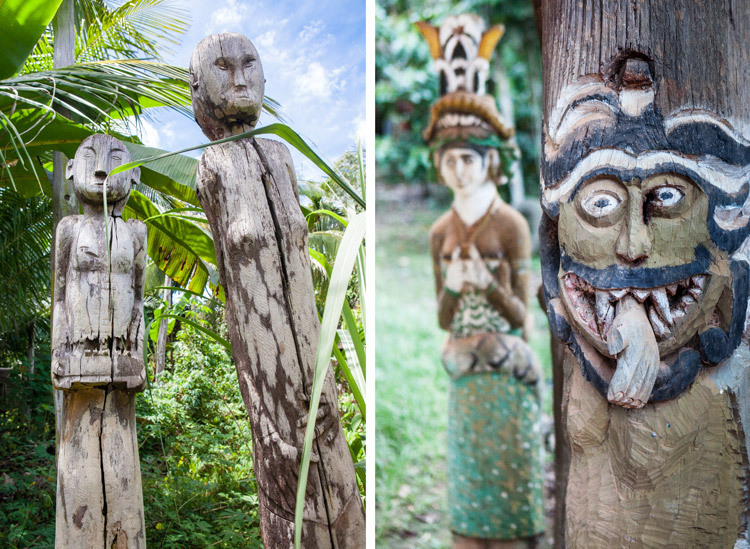 At other times the posts, which can be 5m or more high, just stand around looking mysterious and powerful, often half-concealed amongst vegetation at the back of homes. 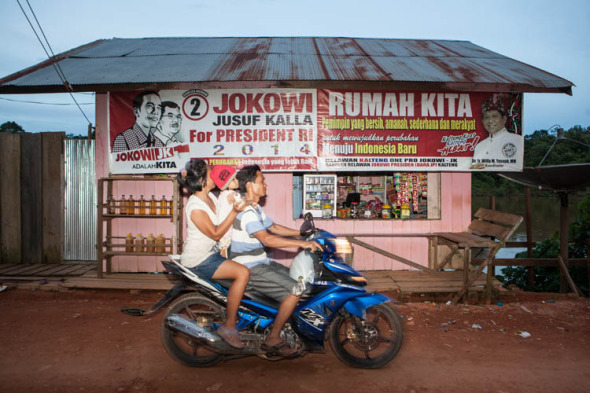 The Indonesian Presidential election was held on the 9th July last year, but there are still a lot of banners and other promotional material around. And lots of people (mostly poorer people) wearing tee shirts promoting the candidates. There must have been millions of them distributed during the campaign. Interestingly, hardly anyone seems to be wearing tee shirts for Prabowo Subianto (the loser). The main industry of Tumbang Manggu is logging. 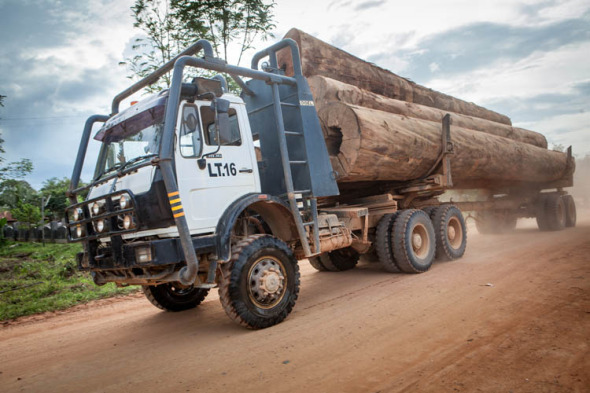 The logging company – PT Dwima – is (apparently) one of the better ones, although much of the country around the village appears to have been clear-felled. There is some preliminary milling done in town, and massive rafts of felled timber are assembled on the river and floated away to the big mills downstream. The company is the biggest employer in town and puts a heap of money into local schools etc. 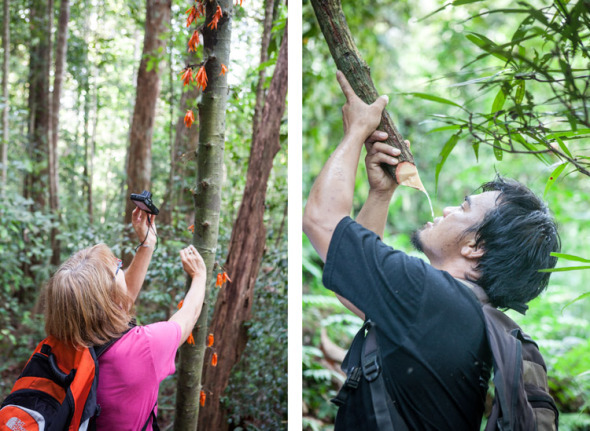 We were taken out to a protected bit of forest on the three hills collectively named Bukit Bala, and climbed to the top through beautiful (but still mostly secondary) forest. We were guided by a bloke from PT Dwima, who showed us wonders like the thick woody vine that releases massive amounts of lovely fresh drinking water when cut open, flowering tree trunks and huge fungi. 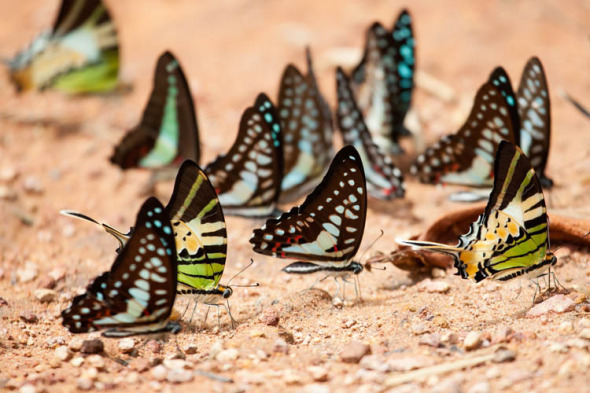 On the edge of the forest we came upon a huge convention of different species of butterflies all swarming around a patch of earth. They were quite stunning, and we were only slightly put off when told it was a indication that someone had recently urinated at that spot! The forestry roads are windy, steep and muddy in places. The logging trucks have absolute right of way, and they hurtle along, cutting across to the inside of every corner that they navigate along the road. Consequently there are arrow signs all the way telling other drivers which side of the road they must drive on. The sides can change frequently, pretty much with every bend that you drive around, so it’s important to pay attention! 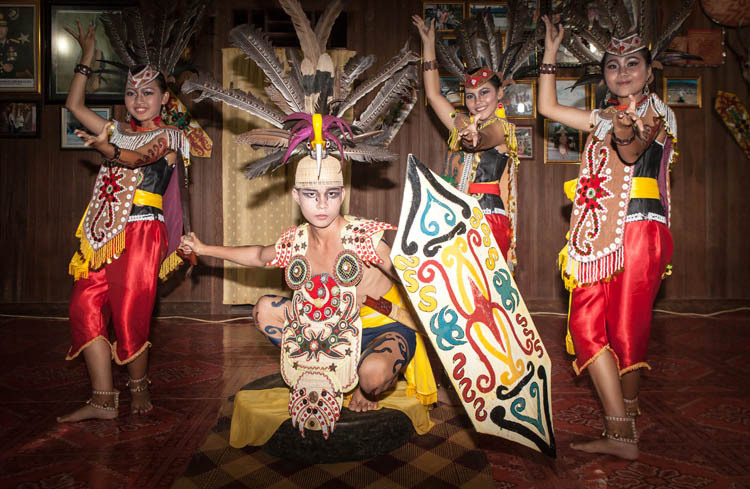 On our second night in the longhouse a Dayak dance and music performance was staged for us. The dancers, and most of the musicians, were teenagers from the local high school, and they were led and trained by teachers from that school. And they were remarkably good, and the boy who was the chief dancer was truly scary as he slashed around with that big mandau bush knife. On our last morning we accepted an invitation to visit the high school and meet with teachers and students. It was recess when we arrived, and the headmaster made an announcement over the PA that we would be visiting two specific classes. There were immediate loud cheers across the playground, and the students of those two class raced back into their classrooms. We talked to them for a while in our clumsy Bahasa Indonesia, and our even clumsier Bahasa Dayak. In fact, “Selamat hanjewu! Narai kabar?” (“Good morning. How are you?”) is about the extent of it. But they seemed to enjoy it, especially when Sally and Karen got the kids to stand and do a one-legged yoga pose! 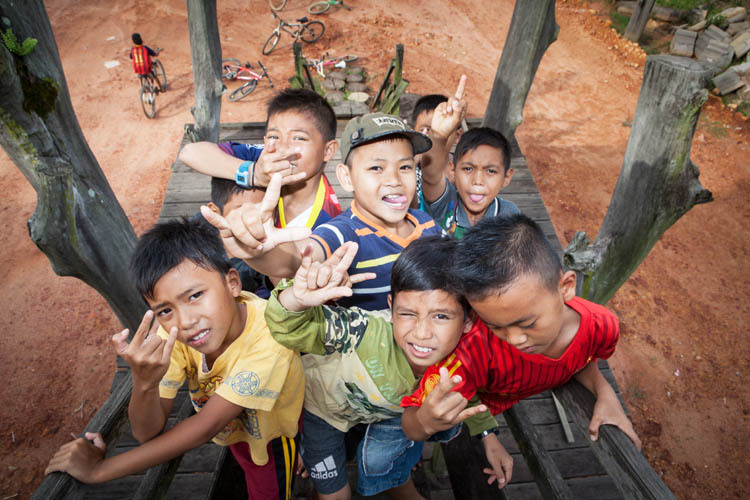 This entry was posted in General and tagged Central Kalimantan, Dayak Ngaju, Kalimantan Tengah, Katingan River, Sungai Katingan, Tumbang Manggu. Bookmark the permalink.